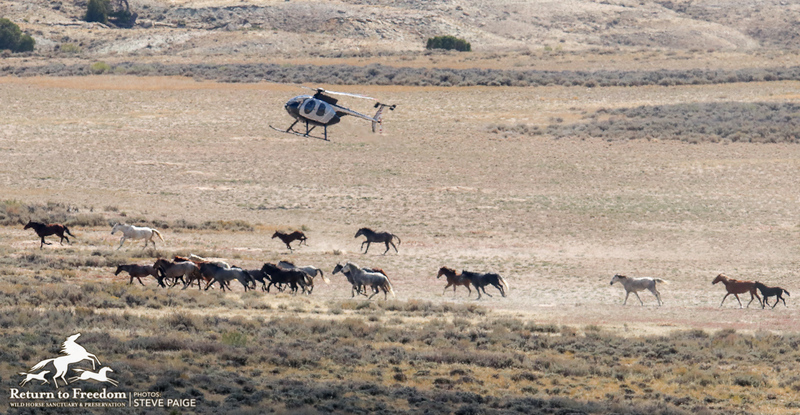 Contractors helicopter drive wild horses toward the trap at the Adobe Town Herd Management Area in Wyoming on Sept. 26. RTF file photo by Steve Paige. CA contractor’s helicopter pushes wild horses toward the trap at the Adobe Town Herd Management Area in Wyoming on Sept. 26. RTF file photo by Steve Paige. Oct. 17 update: The Senate Interior Subcommittee and full Appropriations Committee have delayed their hearings. We’ll update you when they reschedule. The good news is that this again gives us more time to log calls with Senators. Please don’t let up! The Bureau of Land Management on Sunday used a pair of helicopters to trap 123 adult wild horses and 34 foals at the Adobe Town Herd Management Area in Wyoming. Their capture brings to 1,717 the total number of wild horses taken from the from the Salt Wells Creek / Great Divide Basin / Adobe Town herd management areas in southwest Wyoming’s Checkerboard region. The BLM is not counting foals and weanlings under age 1 against its goal of capturing 1,560 wild horses from in and around the three herd management areas. A U.S. District Court on Friday rejected a preliminary injunction filed requested by advocates because the agency has not been counting foals, a change from past practice. The agency reported no deaths or injuries on Sunday, keeping the number of wild horses that have died at 13 — each one euthanized for what BLM says was a preexisting condition with “a hopeless prognosis for recovery.” No veterinary reports have been posted. The roundup will continue on as the U.S. Senate Interior Subcommittee prepares to reveal its version of the Interior Appropriations bill on Tuesday, with the full Senate Appropriations Committee set to vote on Thursday. BLM’s Wild Horse & Burro Program is funded as part of the Interior bill. The House’s version of the Interior bill, already approved, includes an amendment that removed protective language. 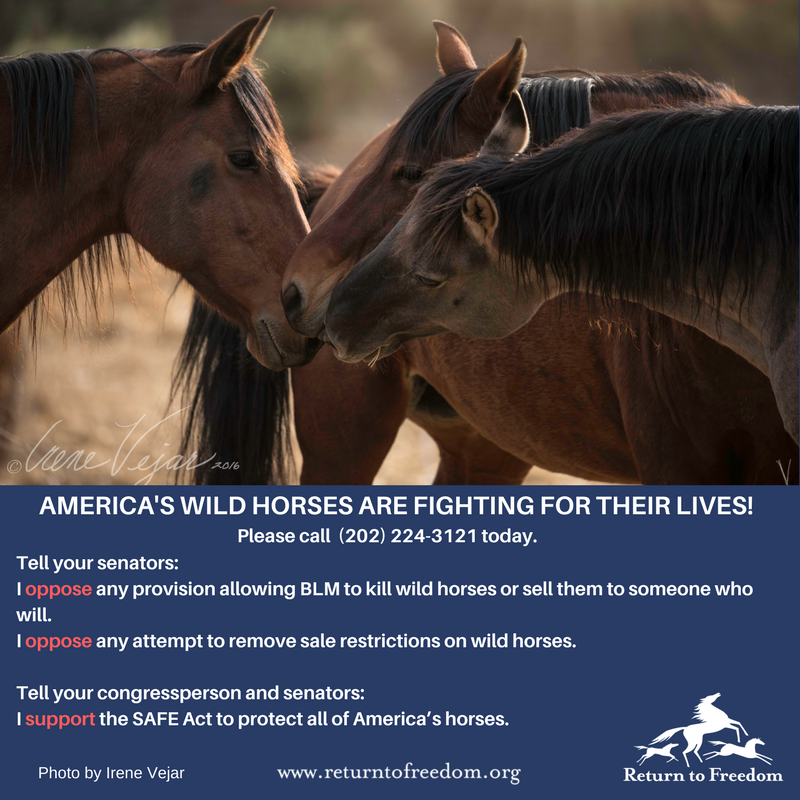 That will open door for BLM to euthanize — shoot — healthy unadopted wild horses and burros if the Senate does not stand in the way. About half of the captured wild horses (mares, foals and weanlings) are to be shipped to the Rock Springs, Wyo., Wild Horse Holding Facility. More recently, BLM said that those wild horses would then be moved to the Bruneau Off-Range Corrals, located southeast of Boise, Idaho. The remainder (studs and some yearlings) will be sent to the Axtel, Utah, Wild Horse Corrals, which earlier this year was the site of an outbreak of strangles. The captured horses are to be offered for adoption, and those that are not adopted will be moved to long-term pastures, according to BLM. Both the corrals in Bruneau and Axtel are privately owned facilities, closed to the public. At roundup’s end, 21 mares are to be released after being collared as part of a movement study. BLM’s Friday report noted that 50 wild horses were “gathered” as part of the study, but it is not immediately clear whether those horses were otherwise counted and whether they included mares collared last winter. The Salt Wells Creek / Great Divide Basin / Adobe Town HMAs are part of Wyoming’s Checkerboard: a largely unfenced region alternating blocks of public and private or state land. The roundup is set to take place over a combined 1.7 million acres of public land and 731,703 acres of private land.